"Victory!" Cries the Frightful Four! 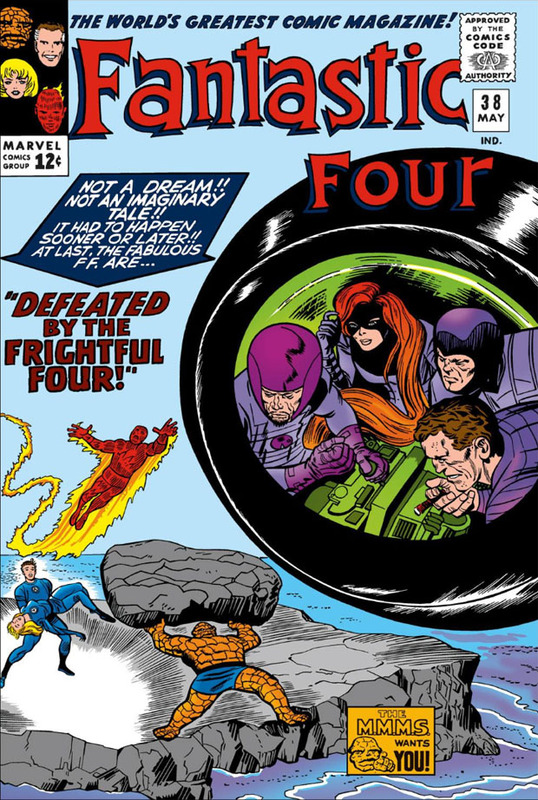 The second appearance of the Frightful Four is often overlooked in light of their subsequent and now classic battle with their counterparts in the Fantastic Four, a final battle which had the evil FF on the brink of victory but ended in the dissolution of the original lineup of this classic team of villains for all time. Yet that second meeting was a key encounter in solidifying their threat level and cementing their status as a force to be reckoned with, however briefly. Once Madam Medusa was no longer a part of their operations, the Frightful Four had the wind taken out of its sails, going through one replacement member after another but never reclaiming its glory days. Perhaps that's one reason why its five appearances (if you're counting their brief reunions in Europe and Whisper Hill) are remembered above all others. Yet as much as their third battle with the FF assured their standing as one of the most ruthless and outstanding villain groups in comics, it was their second battle, at an abandoned Pacific atoll where the Wizard had prepared a carefully laid trap for their enemies, that saw them follow up on their first encounter with the FF--a fight which ended in a stalemate but would lead to their total triumph just two issues later, one that even had the issue's cover declaring their victory for all to see. Can no one stop the Frightful Four?? 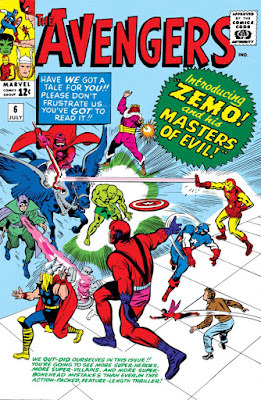 Enter: The Masters Of Evil! 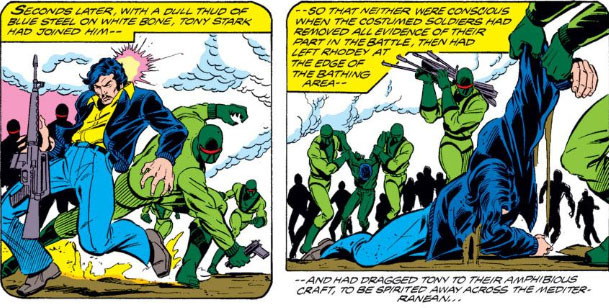 The name of the Masters of Evil has long resonated in Marvel stories--a classic villain group that arguably remains the standard by which other alliances of villains are measured. Many villain groups have come and fallen by the wayside--yet the Masters of Evil, whatever lineup claims the title and whoever claims its leadership, remains The Masters Of Evil, and its reappearance is never taken lightly. They're one of the few assemblages of villains whose reputation precedes them--and given that they're no strangers to defeat and have often seen their careful and elaborate planning fail to meet with success, the fact that word of their activities is always regarded seriously speaks volumes. Since we know of the Masters of Evil primarily through the pages of The Avengers, we can find their premiere appearance in an Avengers issue from mid-1964, when the original team of Avengers was still building its reputation and its readership, and the time seemed right to give them a villainous super-group that challenged the Avengers' strength in numbers with its own array of deadly opponents. 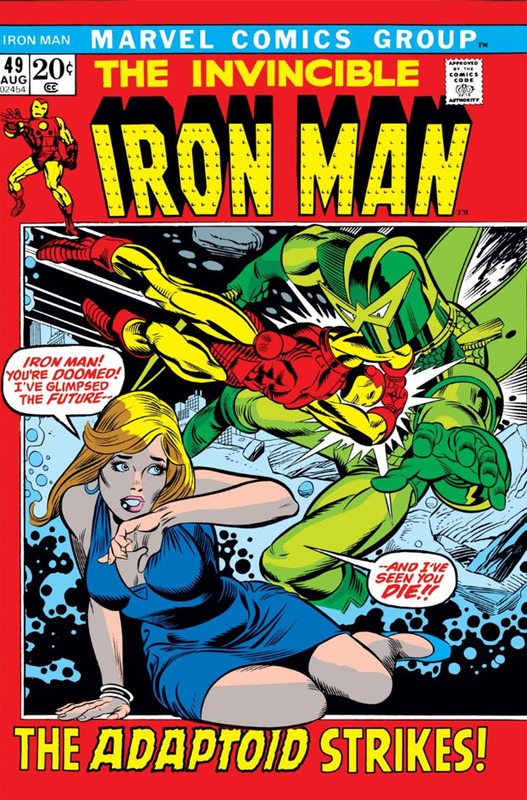 In addition, the newer cover features none of the "personal touch" wording from Marvel, which in those early days was doing a masterful job of building brand loyalty by communicating with its readers in witty asides and, as is evident here, self-deprecation. There's also considerably more real estate on the annual cover, with the battle taking place on rooftops as opposed to street-level. Zemo is a fine choice for the group's leader, since he excels in ruthlessness and planning but also is provided with a connection to Cap that somehow accounts for the mysterious hood he wears, a story within a story that expands this tale into something more than a face-off of costumed characters and which Lee deals into the main plot and handles quite well. But what do the Black Knight, the Melter, and the Radioactive Man bring to the table? The Knight supplies the group with air support and his lance's advanced weaponry; the Melter's value is self-explanatory; while the Radioactive Man's abilities are much like the Melter's but more extensive, without the need for any sort of mechanism. He can also use the light of his power to exert a hypnotic ability (as Zemo can with his "hypno-staff"). It's a given that the Radioactive Man is the group's most lethal member, able to emit his deadly radiation at any level he wishes; in addition, he can withstand a direct hit from Thor's hammer with ease, which certainly makes him an asset going up against the Avengers. We learn very early in the story of the grudge which Zemo, a former Hitler scientist, holds against Cap, following an incident when the two met during the war and Cap's hurled shield shattered a vat containing Zemo's new project--a super-strong substance known as "Adhesive X" which could not be dissolved. Zemo, who wore a concealing hood over his face to avoid retribution from his victims, was caught in the outpouring of adhesive from the vat, with the substance gluing his hood to his face forever. 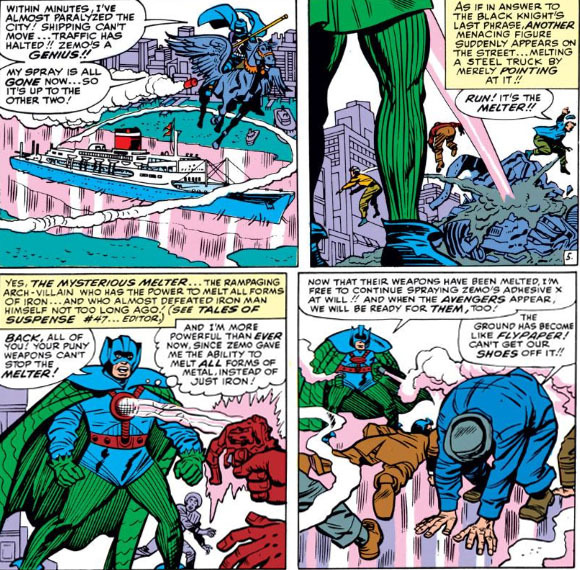 (Through the miracle of comics, Adhesive X was pretty selective about not coming into contact with the rest of his clothing, so at least the good Baron wasn't *ahem* stuck wearing a Nazi uniform for life.) When Zemo, living in a jungle in South America, learns of Cap's resurrection, he vows to exact his revenge--though he may find that a two-way street, since we learn that Zemo was responsible for the booby-trapped drone plane which took the life of Cap's young partner, Bucky. 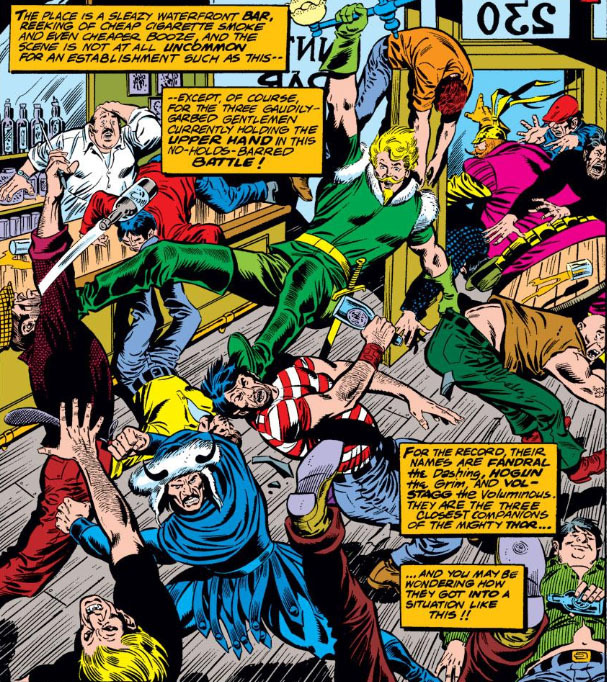 It doesn't take long for the story to establish the connection between Zemo and the others--when, thanks to the release of Adhesive X which effectively paralyzes parts of New York City, the new Masters of Evil attack! 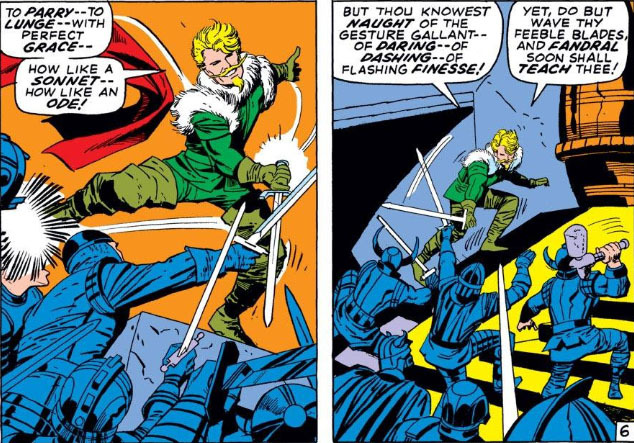 The Derring-Do of the Dashing Fandral! 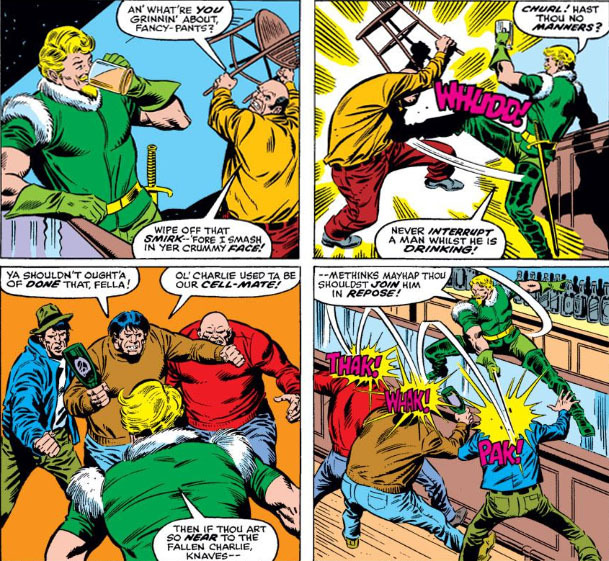 As part of the "Warriors Three," the style of Fandral, the Dashing doesn't get as much of the battle limelight as his mace-wielding partner, Hogun the Grim, or his boisterous, bellowing comrade-at-arms, the voluminous Volstagg--though with his flair for swordplay, you'd think Fandral and limelight would go hand-in-hand together. 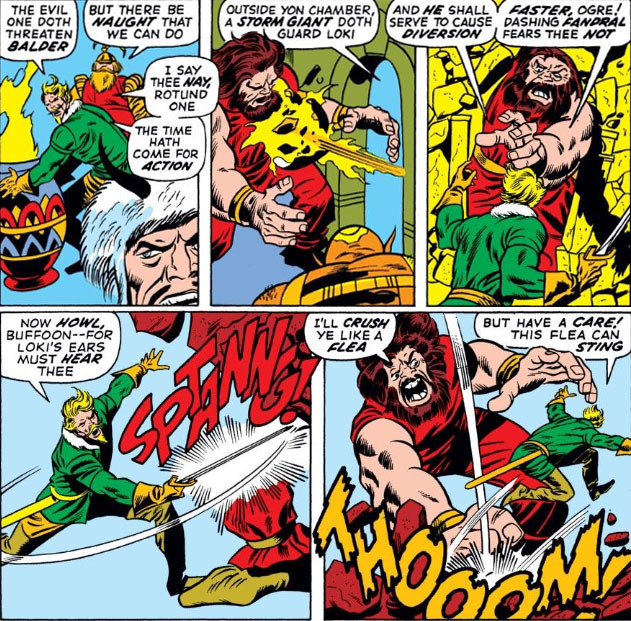 As an Asgardian, perhaps there is no place at the front of the charge for a warrior who isn't bloodthirsty and eager to run you through or club you on sight, instead preferring to swing on draperies and toy with his adversaries in a display of superior skill. 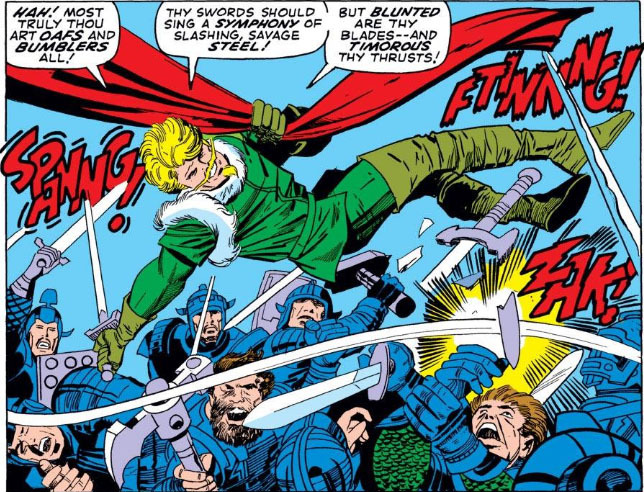 Yet when it comes down to it, Fandral has the battle lust of any Asgardian, and can rage at a foe with the best of them; but when the opportunity presents itself to display a more deft touch with the sword, Fandral indulges in battle as only he can. Fandral is arguably the most dynamic of his three comrades, and unquestionably the best showman, with his tendency to impart lessons to his foes on how to become more polished in battle while enjoying the experience. More often than not, his banter can prove as frustrating to those who take him on as his obvious and seemingly casual ability to humiliate them. Even in the heat of battle--sometimes especially in the heat of battle--it's difficult to separate Fandral from his ego and self-confidence. Granted, you'd be hard-pressed to find an Asgardian who wasn't confident in their ability to defeat their foe; but you could make the case that Fandral's assuredness in his skill bolsters that confidence and his desire to win, as he'll gladly attempt to prevail against near-impossible odds--the more pressed upon, the better. And you certainly can't argue with results. It's on Earth, of course, where the gods of Asgard stand out in both appearance as well as their regard for mortals. 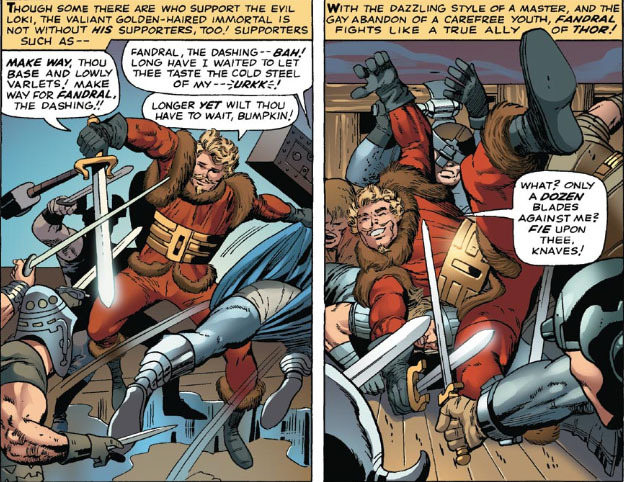 When the Warriors Three received their own "Marvel Spotlight" during one of the times they'd followed Thor to Midgard, they were bound to go out adventuring--though with these three, trouble almost always finds them. 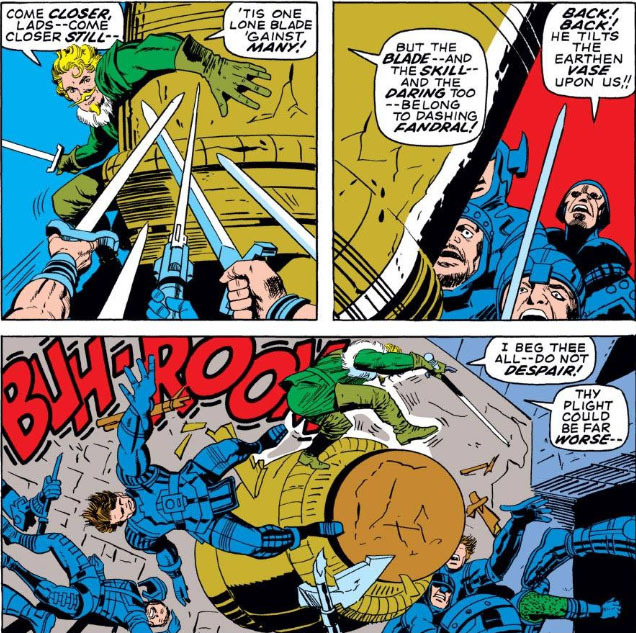 This 1976 story began with that spotlight, as usual, finding its way to Fandral--and literally, at that, when he ascends the wall of a building to talk down a woman who appears intent on ending her life. 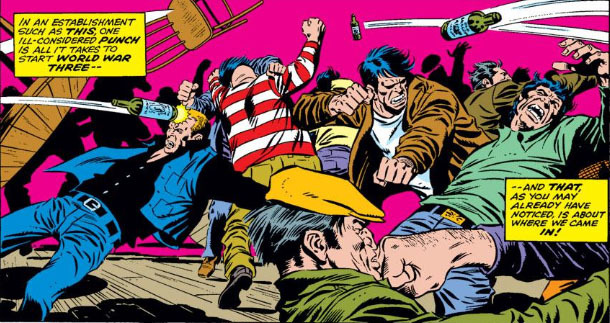 The search for Mary's fiancé leads Fandral and his comrades to a local watering hole (courtesy of an obliging drunken fellow they encounter named "Rags," who's more than happy to lead the way). But information doesn't come easily from these patrons, though Fandral will likely consider the evening a success either way. 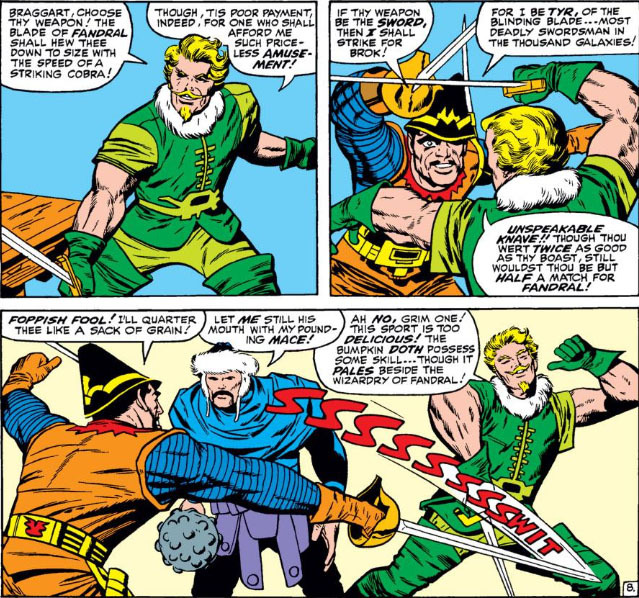 Earth has other diversions to offer Fandral, of course--yet in one rather indiscriminate encounter, it's clear where this man's priorities lie when push, as in this case, comes to shove. ...you spar with Fandral, the Dashing--and school is now in session, bumpkin. 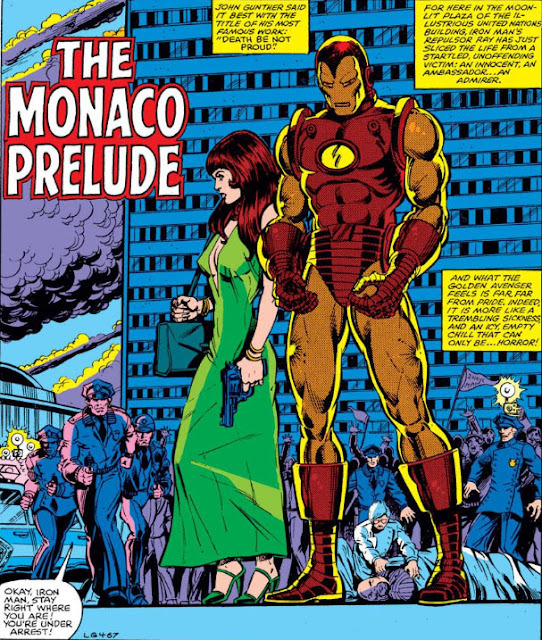 When we left Tony Stark and James Rhodes, they were probably wishing that Stark's invincible bodyguard, Iron Man, was standing with them front and center, as they found themselves surrounded by an assault team that had landed on a Monaco beachhead on the orders of Justin Hammer. Arriving in the city-state to track down a lead on the man he believed was responsible for framing him for murder, Stark, along with his wingman, Rhodey, was soon attacked by armed men when he was getting too close to discovering the identity of his enemy--and after he and Rhodey had barely escaped with their lives, the two engaged in a highway firefight with their pursuers until finally crashing on the beach and finding themselves surrounded and outnumbered by well-equipped reinforcements. What happened next, Rhodey remembers to a certain point. What he doesn't remember is what happened to his boss, who is now missing along with those who attacked--leaving him to deal with the locals, who obviously have not rooted for the underdog in the fight that took place in their midst. While Rhodey attempts to prove his bona fides with the gendarmes, we have the advantage of being able to look back and see what actually happened when he and Stark found themselves forced to make a last stand against Hammer's goons. Had Iron Man actually been with them, things might well have turned out differently, and it would be the goons heading off to jail; but as long as Hammer's technology had forced Stark to sideline the Iron Man armor, Stark was forced to make do with a crash course in self-defense, courtesy of Captain America--and the pupil was unfortunately not yet near the level of prowess of his teacher. Unceremonious as his capture was, Stark will at least find he's accomplished in defeat what he came to Monaco for: learning the identity of the one who has it in for him. At last, Stark meets his new business competitor--and his ruthless new foe. 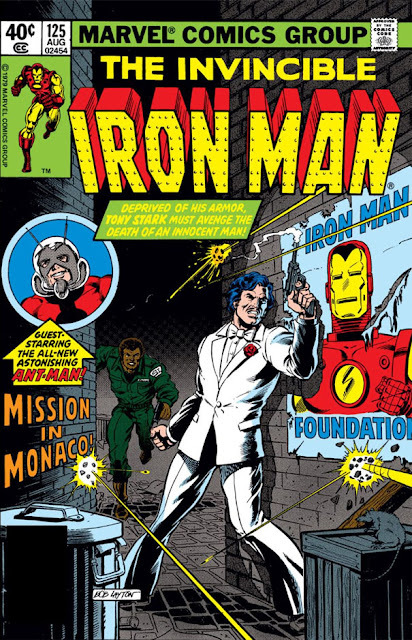 Iron Man: Marked for Murder! While the cover of Invincible Iron Man #125 is shrewd enough to provide its money-maker title character exposure in some capacity, the character who steps forward to take the lion's share of this issue's story is none other than... Anthony Stark, man of action! That shift in focus is due to the machinations of Justin Hammer, whom we have to thank for taking Iron Man out of action by framing him for murder. 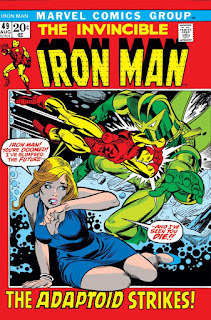 This story lands us in the middle of a crisis for both Stark and Iron Man, following a U.N. reception for the Carnelian ambassador where the press and an assembled crowd watched in horror as Iron Man put a repulsor ray through the ambassador's chest. 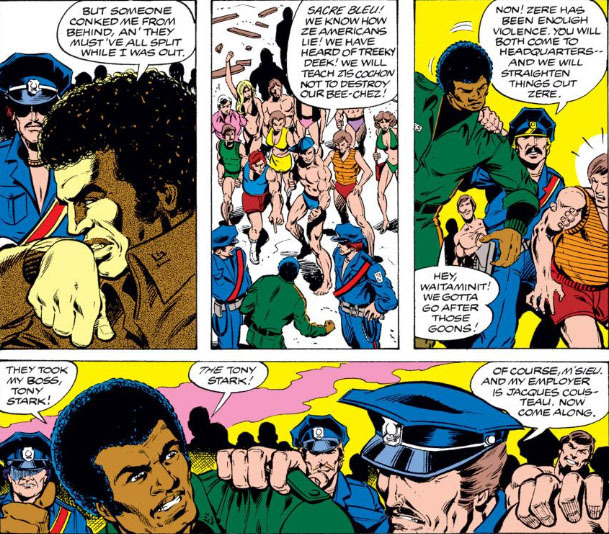 It was one in a string of unexplained malfunctions of Iron Man's armor, and surely by far the deadliest one--and this time, there would be consequences, as the police move in to arrest the Avenger. The Allies and The Avengers! 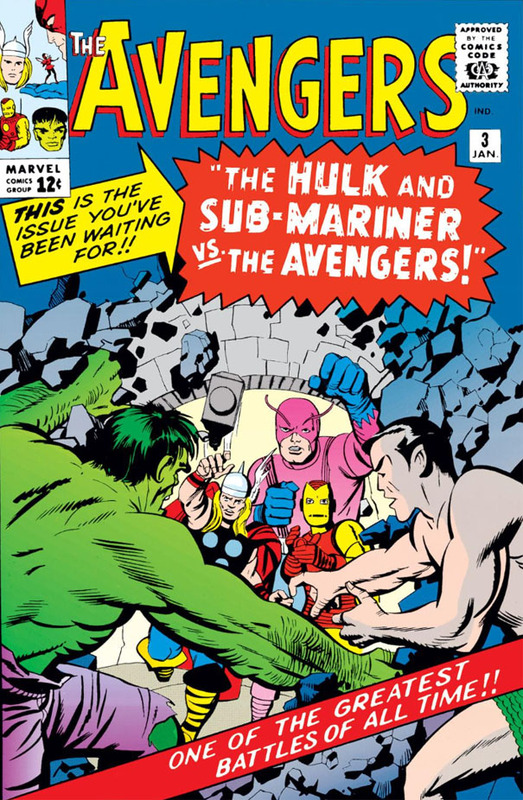 I wasn't collecting comics at the time, but I imagine readers of The Avengers from day one were curious to read its third issue, which followed up on the Hulk's unexpected exit from the team so soon after its formation. 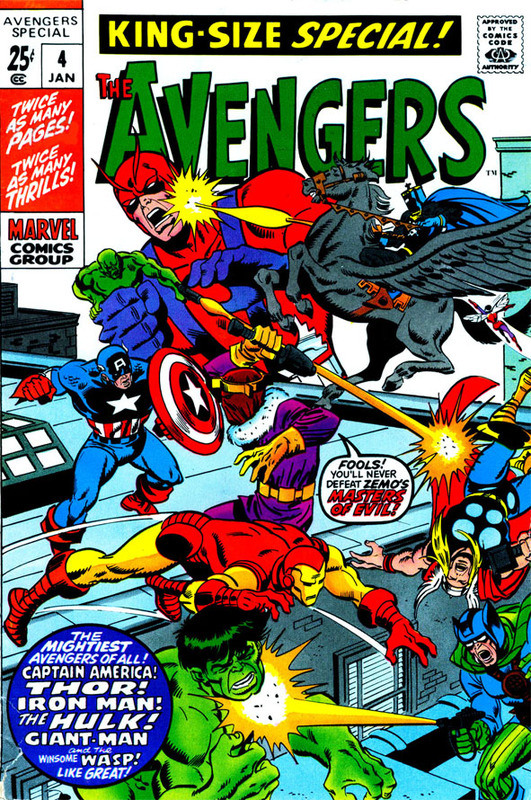 Granted, membership in the Avengers wasn't set in stone; unlike the Fantastic Four, the group wasn't required to stick to a set number of members, and characters could come and go at the writer's discretion. Though in the Hulk's case, it would be like a job applicant who has assets that clearly benefit the company he wants to work for, passes muster in terms of being able to take on a challenging workload, is eager to start, and signs on the dotted line--only to realize his second day on the job that it's not for him and decides to leave, with zero notice, and slamming the door on his way out. In addition, there were only so many heroic characters in Marvel's stable in late 1963. Would writer Stan Lee leave the group pared to four? And if not, who would be approached for membership? Daredevil wouldn't make his debut for another three months. That leaves: Spider-Man? Dr. Strange? It was an interesting development from a sales standpoint, as well. At the time, the book was the only exposure for the Hulk, his own title cancelled roughly eight months prior--and without the Avengers to wrap around the character, he would literally go nowhere. If Lee had wanted to reignite interest in a solo title for the Hulk, how would jettisoning him from the Avengers help? 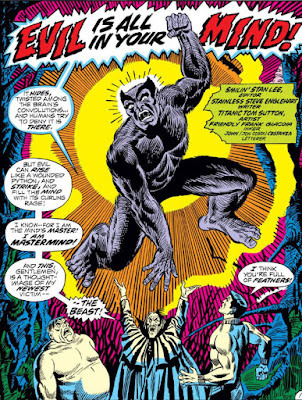 Apparently, that was a worry for another day--specifically, about 300 days down the road, when the Hulk would reappear as a feature in Tales To Astonish, sharing the book with Giant-Man (who was still part of The Avengers). 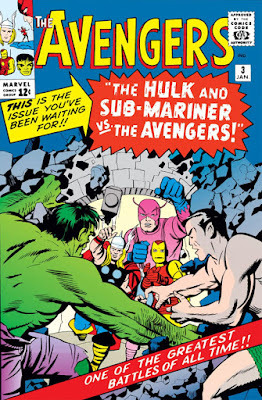 For now, however, the Hulk would get a little more mileage out of his Avengers stint even without an Avengers I.D., as the team considered it imperative that they ascertain the status of their former member--a process that, given the book's bi-monthly publication, would take another six months, with the Hulk still remaining in the cover's corner box grouping for an extra issue after that, as if to squeeze the last drops of water from this stone. 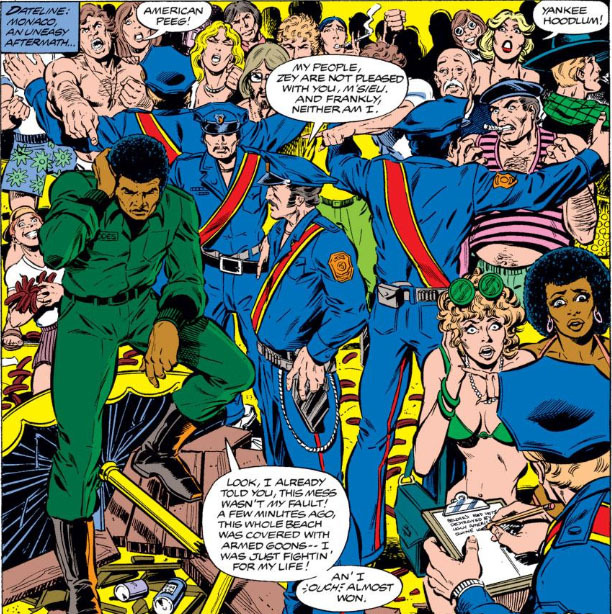 It's his exit, of course, that begins a string of "guest star" appearances in the Avengers title for the Hulk, with the issue which follows up on his departure pulling double duty where he's concerned. In the story's first part, we find the Hulk has returned to the southwest, as the Avengers attempt to track him and... do what, exactly, if and when they find him? Try to convince him to return? Retrieve him by force if he resists? Determine whether he can be trusted to remain at large? Having a set goal would determine how they proceed with their former member, instead of playing it by ear depending on the reception they get from him. 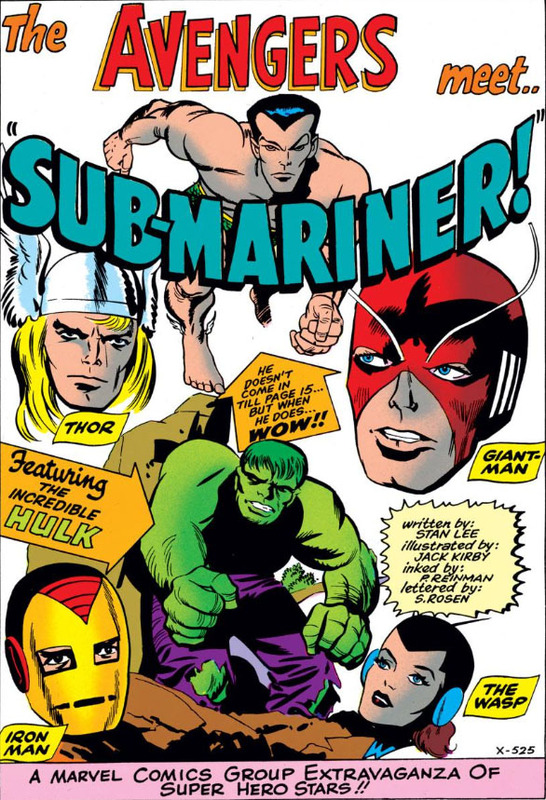 It's understandable that the Avengers should want to find him, given that they bear a certain amount of responsibility for him now that he's angrily left their ranks--but as we'll see, the team will work at cross-purposes when dealing with the Hulk, and having no real plan going in wasn't likely to accomplish much. The story's second part is a little more straightforward, with the addition of a joker in this deck who has his own axe to grind with the human race and who, as it turns out, also wishes to find the Hulk. 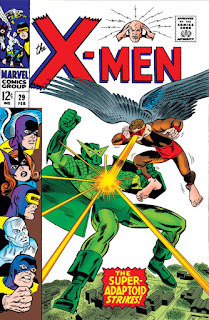 Issue #131 of Uncanny X-Men has so much going for it that it's hard to know where to begin. The team has finally found its legs by this point--not only creatively, with writer Chris Claremont and artists John Byrne and Terry Austin turning out a steady stream of quality product--but also as a result of the team itself now being stabilized, with their field leader, Cyclops, having adapted to the styles of the new people he's come to know on a personal and professional level as they've worked out their rough edges in various conflicts. This team is now the X-Men in name and deed, with even their mentor, Charles Xavier, loosening up on the reins and giving them more of a free hand in the field, if grudgingly. (He's not quite ready to relinquish those reins, as the following issue would make apparent.) 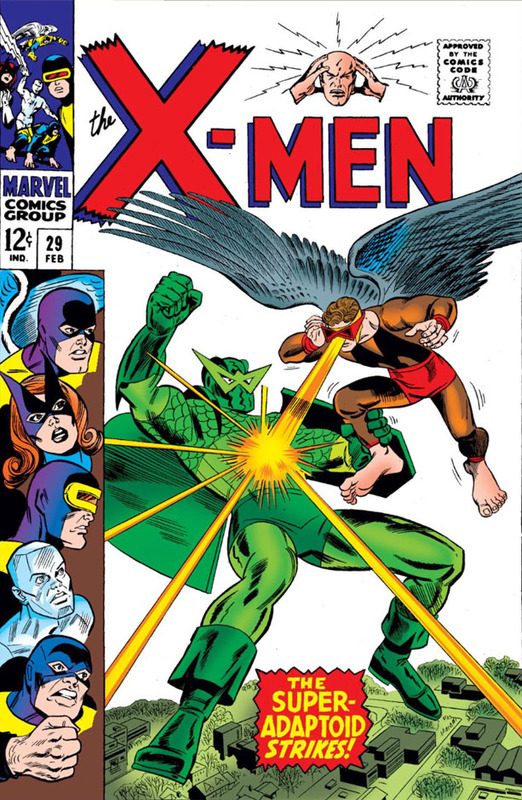 They've also made contact with their first "new mutant," Kitty Pryde; Jean Grey, now known as Phoenix, has integrated with the team, with herself and Cyclops making for a nice team blend of old and new; and the X-Men have had their first encounter with the Hellfire Club, a group that would become one of its major nemeses and would certainly qualify for an entry in their rogues' gallery. 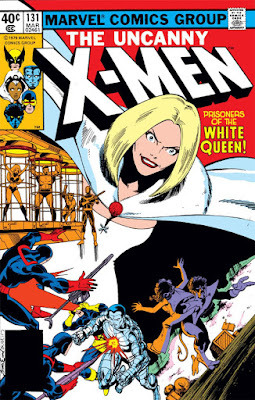 It's during their meeting with Kitty and her parents that three of the X-Men--Wolverine, Colossus, and Storm--have come under attack by armed men in the employ of the Hellfire Club, with the Club's "White Queen"--a powerful telepath named Emma Frost--taking them all down with one strike and ordering them captured. (Along with Xavier, who's ambushed off-panel.) 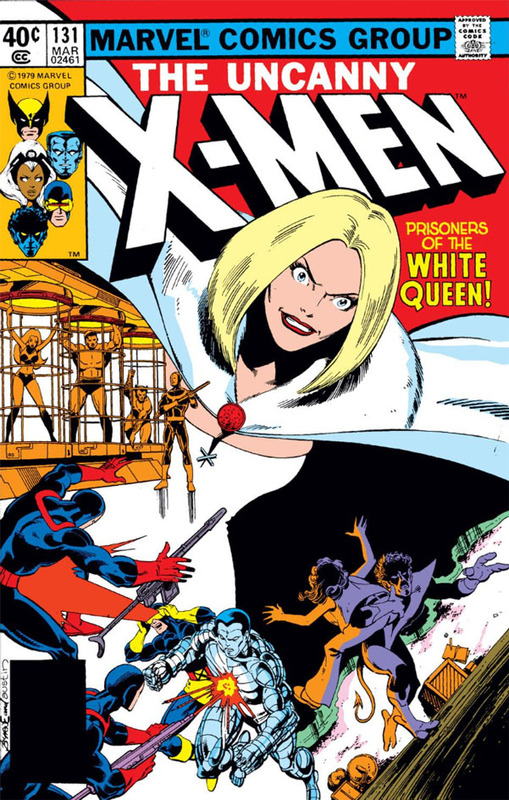 Kitty, who was with them at the time, manages to escape and track them to Frost's complex, using her newly-discovered "phasing" power to reach Storm and the others before escaping once more with instructions to contact the other X-Men. Meanwhile, Cyclops (a/k/a Scott Summers) and Jean have recently made contact with another mutant who calls herself Dazzler, and have come under a similar attack by the Club's armed men--and with Dazzler's help, and joined by Nightcrawler, this time it was the X-Men who downed and captured their opposition. 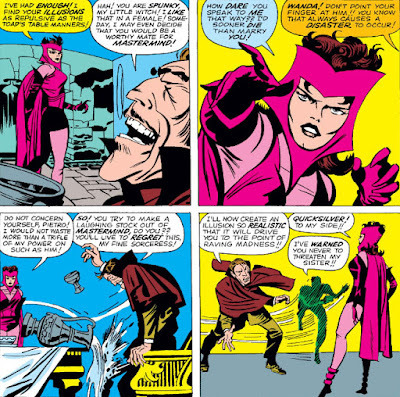 Off-panel, Kitty has made telephone contact with the other X-Men, but now tries to evade the men of the Club who have her fearfully running for her life. What these men don't know is that the X-Men have found them, and the tables have turned. When Stalks The Cyborg Sinister! 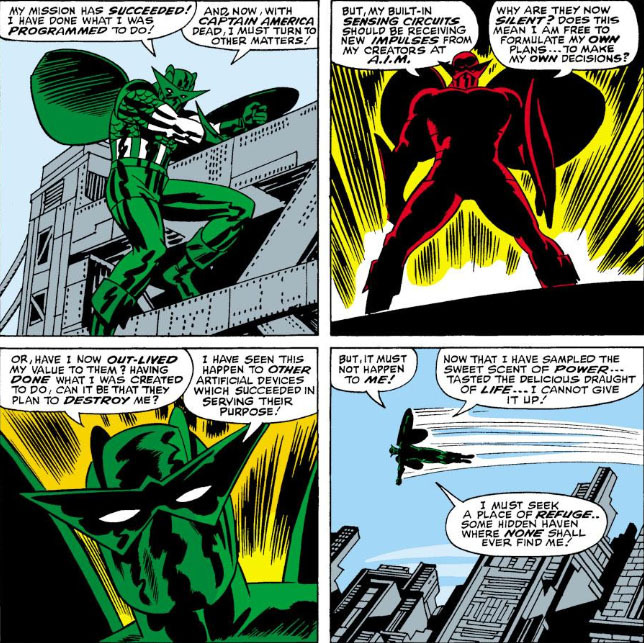 The career of the Adaptoid, a creation of Advanced Idea Mechanics that could copy the likeness and abilities of a super-being and imprint them onto itself, instead turned out to be just a brief string of appearances in major titles like The Avengers, X-Men, and Iron Man before the plug was pulled on the character--or, rather, the first attempt at an upgrade for him. It was a surprising turnaround in fortune for him, considering that all the stops were being pulled out for this character. 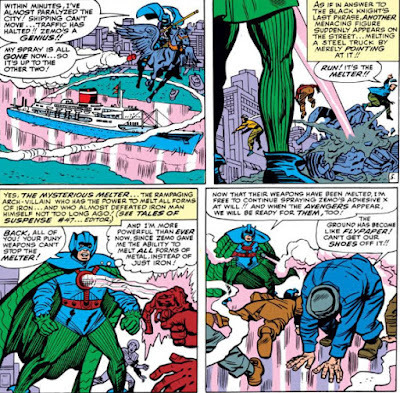 Premiering in the pages of Tales of Suspense and tasked with the mission of eliminating Captain America, the Adaptoid was successful in tracing and adapting Cap's pattern to itself--only to then unexpectedly clash with the villain known as the Tumbler and end up being soundly beaten, though afterward his foe would be met and defeated by the real Cap. Taken to Avengers H.Q. 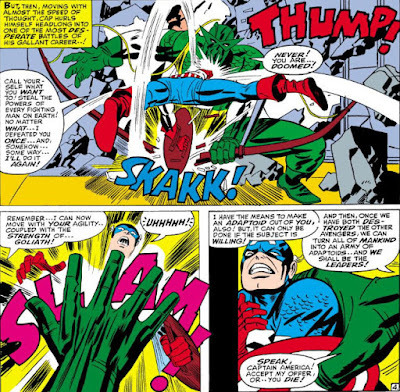 for further investigation, the presumably inert Adaptoid was able to imprint the abilities of the four Avengers who were present (including Cap), with the combination transforming him into an amalgam of all four--thereafter dubbing himself the Super-Adaptoid, and once again attacking Cap after the other Avengers had departed. 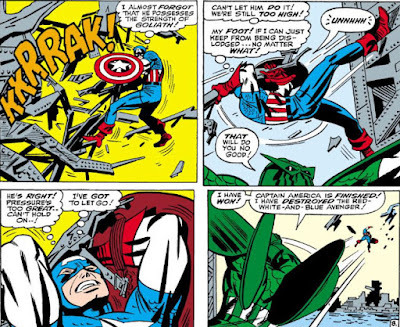 Cap barely survived the Super-Adaptoid's assault, though it would take some time before the villain would discover that his intended victim was still alive; and eventually, it returned to Avengers Mansion to lie in wait for Cap, only to be met by Iron Man, who was able to deal him a defeat. Unknown to either of these combatants, it would be the final battle of the Super-Adaptoid in his present form. But when he re-emerged--good grief, talk about starting from scratch! What the heck is this thing? Mission: Death to Captain America! Of the many creations of Marvel that didn't exactly hit a high note for me, I'd have to count among their number the Adaptoid, a product of A.I.M. that was able to imprint on itself the likeness and abilities of a super-being and thus fulfill any number of covert operations on behalf of its masters. In its raw form, it resembled a featureless, walking blank slate which first infiltrated Avengers Mansion and took the form of Captain America after giving the real Cap a sedative in order to proceed with its "trace" of him. Its mission was to then eliminate Cap and go on to attack S.H.I.E.L.D. ; but before it could proceed, the villain known as the Tumbler crashed in to attack Cap, not realizing the Adaptoid had taken the Avenger's place. Surprisingly, the Tumbler made mincemeat of the Cap-Adaptoid, and figured his rep would be made with this kind of victory--until the real Cap awoke and cleaned his clock. 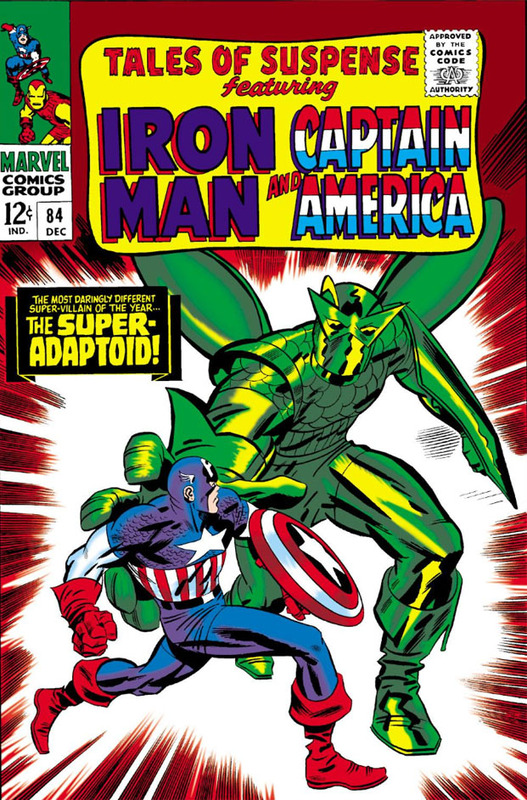 The Adaptoid, now returned to its original state, was carted off to the lab, where Cap is joined by the rest of the Avengers in order to be briefed on it and investigate it further. 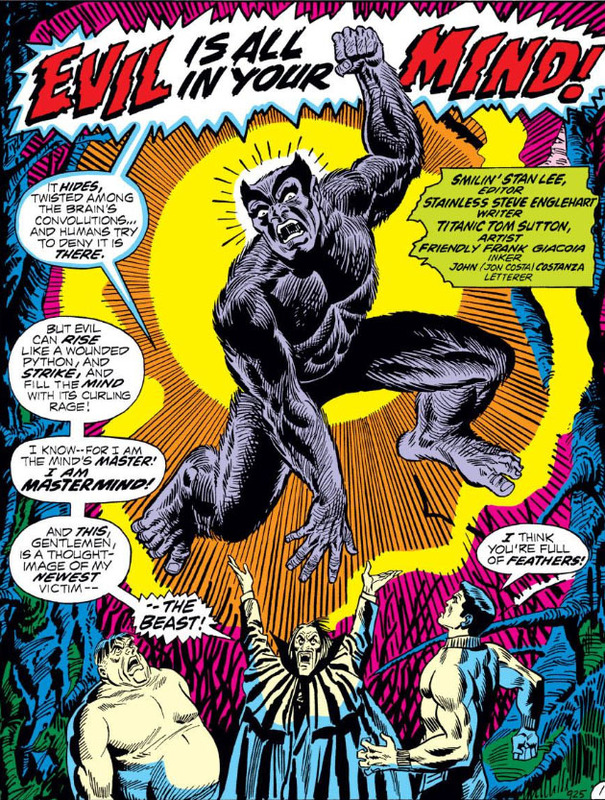 Now, if you have in your custody a construct that calls itself "the Adaptoid," and you've seen first-hand what it's capable of--and you're not sure whether it's still operational--what's the worst thing you could do in its presence? That's right: expose it to four Avengers and practically hand it the means to adapt their powers and form itself into a new, more powerful enemy. The most valuable addition to its power set would of course be Goliath. What are the Wasp or Hawkeye going to do for it? 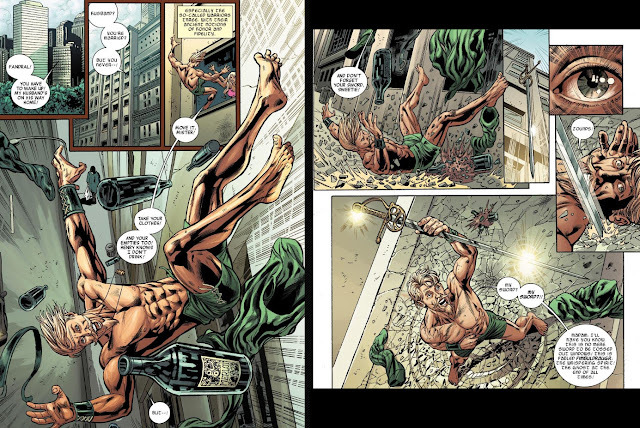 Goliath's trace would already have provided it with the power to shrink or grow; and it would need a quiver of custom-made, specialized arrows to augment the skill of Hawkeye's marksmanship. Nevertheless, once the other Avengers leave on (what else?) "Avengers business," Cap remains behind to guard their guest--and in short order, we're presented with a new Marvel foe that offers greater cover value than the less distinguishable Adaptoid. 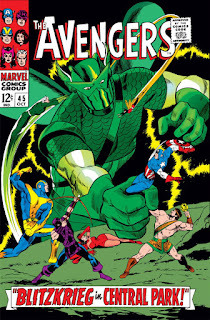 Yes, the Super-Adaptoid, which has received one heck of a makeover and now resembles an amalgam of all four of the Avengers it's imprinted on itself--none of which were green, by the way. But given its startling new features we shouldn't quibble about nonessentials. So what do we have here? Well, let's start with what this thing must now hoist around and still have its hands free to engage in battle: facsimiles of Cap's shield, Hawkeye's bow and quiver, and what appear to be metal wings to give it flight. 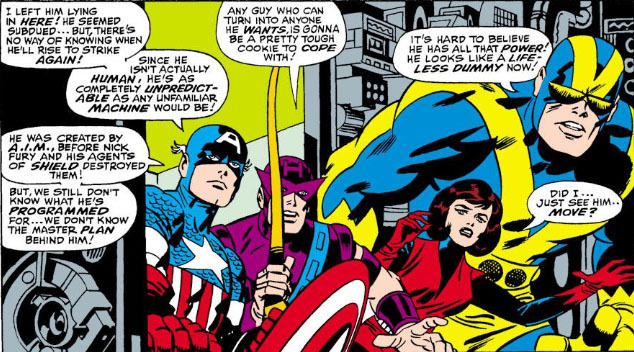 Its powers have also been increased accordingly--not only does it retain Cap's agility, but it now has Hawkeye's weaponry, Goliath's strength, and the Wasp's... the Wasp's... well, we'll have to just go with flight for now. Perhaps it also has a keen fashion sense and a compulsion to flirt. 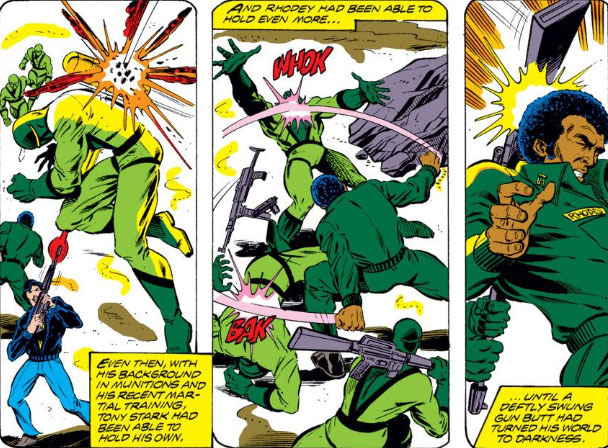 Since the Adaptoid had to take Cap's shield for itself the last time, it comes as news that it's now able to duplicate its own accessories, such as Hawkeye's arrows and bow as well as a new shield. It's a mystery how it's going to fight with Cap's agility and acrobatic skill with all of its gear getting in the way--but thanks to Cap's response, at least it won't have to worry about that huge bow anymore. 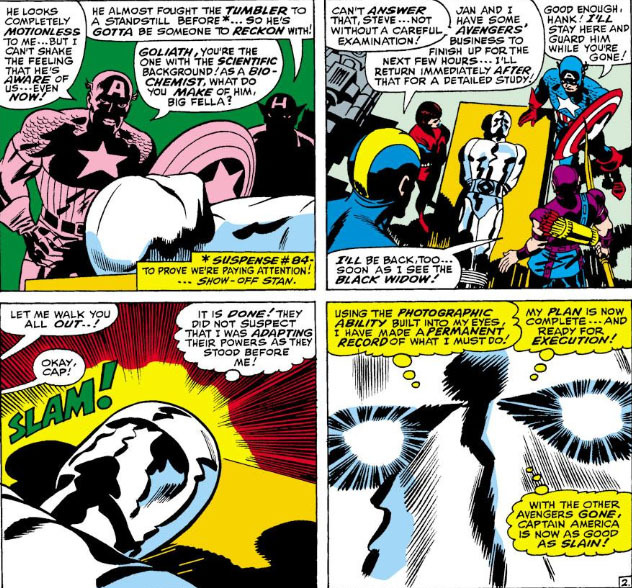 Cap gives the Super-Adaptoid the answer to its ultimatum you'd expect; but even Cap can't match a version of himself combined with the power of Goliath. 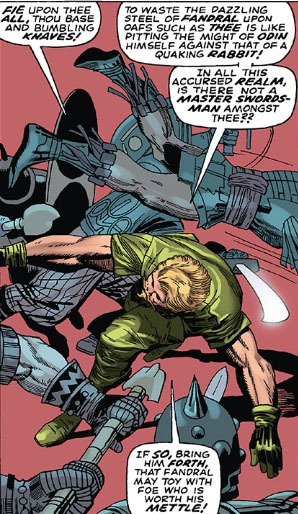 The Super-Adaptoid still has its stock of arrows to use as hand-held weapons, but we've seen all we're going to see of Hawkeye in its behavior. Besides, it appears it's doing fine at overwhelming Cap and keeping him on the run with its other abilities. 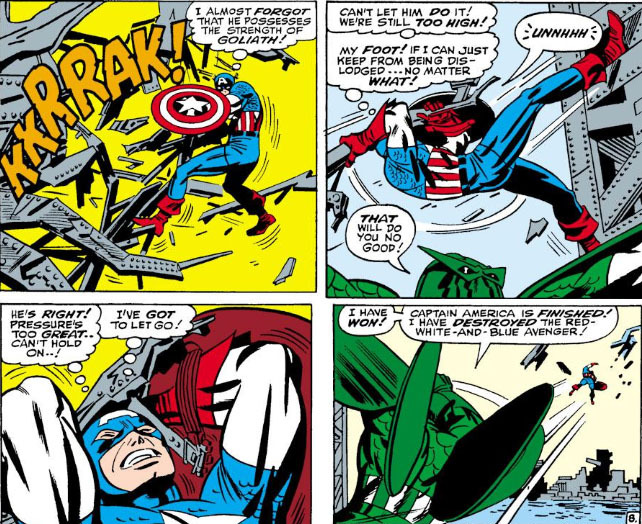 Cap would survive his fall to Earth by a series of aerial maneuvers that let him avoid hitting solid ground. 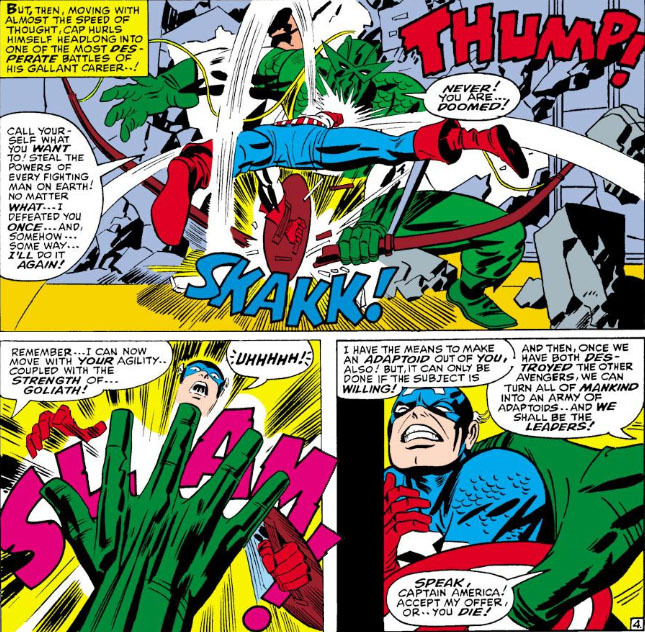 And while he didn't accomplish his mission, it's technically a mark in the win column for the Super-Adaptoid, though Stan Lee's story would have us think that Cap has triumphed just by surviving. As for the Super-Adaptoid, it now appears that he's cut his strings to A.I.M. and can now become a villain in his own right. For now, though, he treats his new freedom and autonomy cautiously, and decides to lay low until he's certain his old masters have truly abandoned him. The Mental Madness of... Mastermind! ...and, not being the type to take no for an answer, trying again. 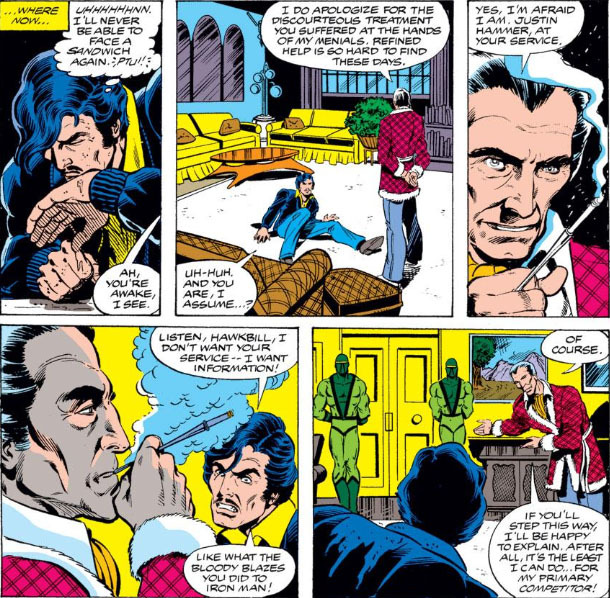 Being called "repugnant" often enough likely had Mastermind using the illusory appearance of Wyngarde (or others) as a substitute for simple courtesy and sincerity in seeking out women, if a poor one. 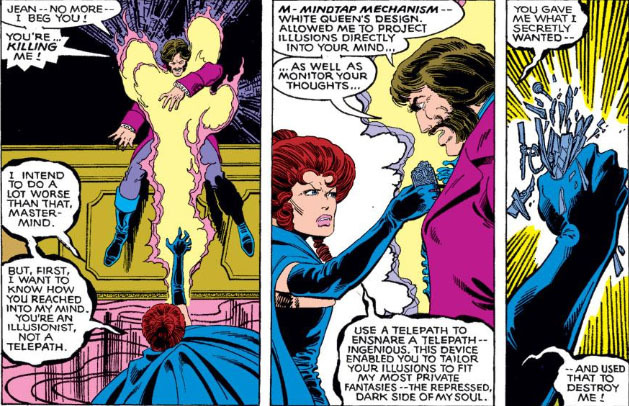 Mastermind would get another crack at the X-Men on his own when he later sought revenge against them for the treatment he suffered from the vengeance of Phoenix; but before we ever laid eyes on Wyngarde or even the Hellfire Club, it was Mastermind who took center stage in a 1972 story that took place while a new manifestation of the Beast was being introduced, a character who would be tailor-made for what Mastermind has in... mind. The Abominable Attack of the Yeti! The Rage of the Wendigo! To Life Comes... The Valkyrie! It's Open Season on Tony Stark! The Coming of... The Defenders! The Appropriation of The Abomination!